Harry Mingail has a 30 year track record of proven success with a large variety of private and public sector clients. 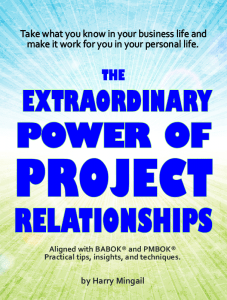 You can count on Harry Mingail to exercise great interpersonal skills by virtue of has book The Extraordinary Power of Project Relationships and the associated workshops he delivers on topics such as conflict management, decision-making, problems-solving, presentation skills, communications and negotiation. Similarly, based upon his PMP, project management training he delivers and his book Project Management Entrepreneuring, your projects will be delivered with precision, on time and budget. And if you need someone to lead or support you in the difficult job of strategic planning, Harry has also written a book (Business Information Technology Strategic Planning) and delivered training about his topic as well. • Management of multiple projects. Achieve the very best project results. For vital new projects, Harry’s workshop facilitation will enable your key stakeholders to prepare a comprehensive and accurate plan while cultivating commitment, collaboration and consensus. For troubled projects, Harry enables turnarounds toward success in a manner which puts aside blame, builds teamwork and generates practical next steps. To maximize team productivity, Harry helps internal and external project stakeholders to operate “on the same page” with regard to key interpersonal skills including conflict management, win-win negotiation, communication, feedback and dealing with change. Accomplish and continuously improve project, portfolio and strategic capabilities. Harry mentors management and staff who occasionally need ideas for solving an important problem, a second opinion or guides those who want to become a Project Management Professional (PMP) or Certified Business Analysis Professional (CBAP).